See the differences between the resolutions offered by 9.7, 10.5, and 12.9-inch iPad models. Apple unveiled the much-rumoured 10.5-inch iPad Pro at this year’s Worldwide Developer Conference in San Jose. The successor to arguably the best iPad the company had made to date — the 9.7-inch iPad Pro, reviewed in our July 2016 issue — this new iPad is nothing short of stunning. As its name suggests, the ‘smaller’ iPad Pro now features a 10.5-inch display, dictating a marginally larger footprint than the model it replaces. I loved the size of the 9.7-inch Pro (as I did the Air 2 before it): it felt perfect when held, especially when compared with the almost comically large 12.9-inch model. But the new 10.5-inch Pro feels similarly appropriate, measuring just 10.6mm higher and 4.1mm wider than before, with the same 6.1mm thickness. The larger screen size has allowed Apple to pack even more pixels into the display: 2224 x 1668 over 2048 x 1536. However, as was the case when the original 12.9-inch iPad Pro debuted (it was the first iPad to deviate from the original display dimensions), apps will need to be tweaked by developers to take advantage of the 10.5-inch iPad’s higher resolution. 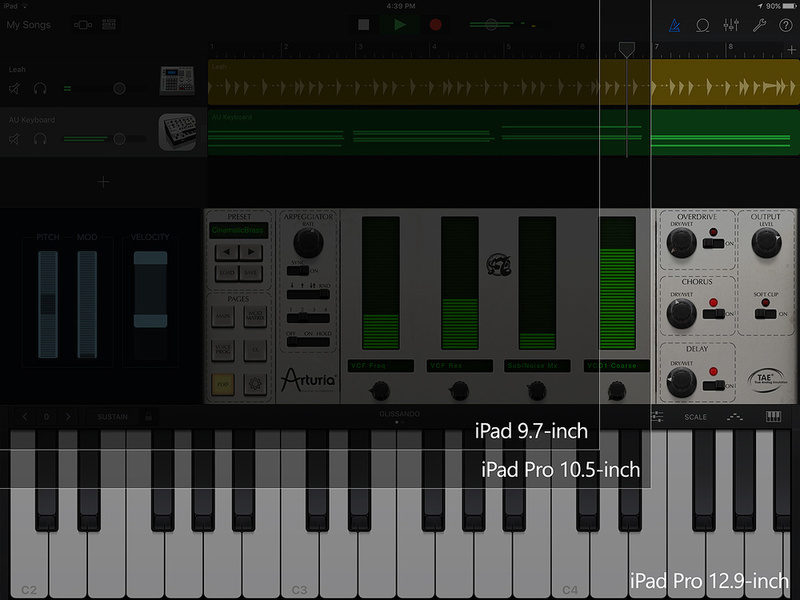 Until this happens, most apps will look the same on the 10.5-inch model as they do on a 9.7-inch iPad, meaning that apps like GarageBand, Cubasis, Auria, Gadget, et al, all display the same number of tracks and channels. Geekbench multi-core scores for recent iPad models.The 10.5-inch iPad Pro features Apple’s latest display technologies, such as True Tone (which adjusts the colour temperature of the display based on the environment in which the device is being used) and P3 wide colour space. And for this latest iPad, Apple have a new technology dubbed ‘ProMotion’. Where Retina displays increased the number of pixels, ProMotion can intelligently increase the refresh rate to 120Hz, when appropriate, meaning that the screen can be updated up to 120 times a second. So why is this such a big deal, I hear you ask? If you consider audio buffer sizes, smaller values offer reduced latency between triggering an event in your app and the audible result — playing a note on a keyboard and hearing the note played by a virtual instrument, for example. In the same way, higher refresh rates allow the display to respond to input with reduced latency. This means that the screen reacts to your finger (or Apple Pencil) input more responsively, and while it’s hard to describe the visceral difference this makes, it dramatically improves the overall iPad experience, making the device smoother and snappier than ever before. 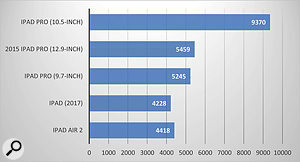 Internally, the iPad Pro features Apple’s A10X Fusion system-on-chip, which offers a significant performance increase over the A9X chip that powered the previous Pro models. Apple claim the A10X Fusion offers 30 percent greater CPU performance, and Geekbench more than confirms this, with the 10.5-inch iPad Pro achieving a multicore score of 9370 and a single-core score of 3902. 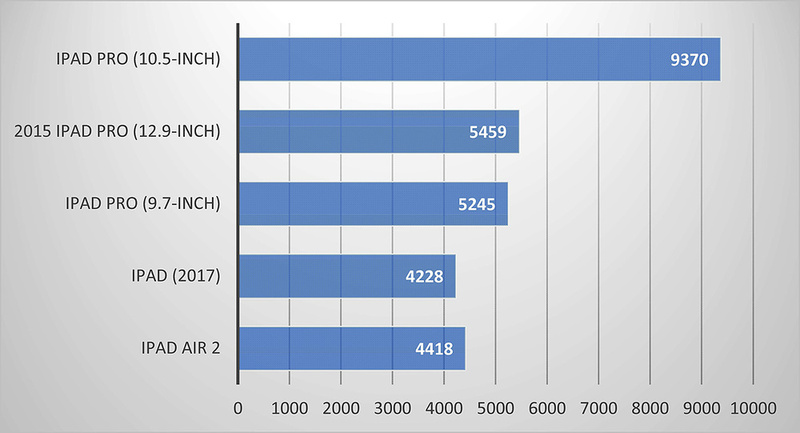 To put this in perspective, the multi-core score is roughly the same as an Early-2011 MacBook Pro, with the single-core score beating current-generation Mac Pros. As well as the good news about CPU performance, perhaps the best news is that this new, ‘smaller’ iPad Pro now offers the same 4GB RAM as its larger sibling, which is a huge benefit for those running multiple apps simultaneously. Another welcome upgrade is that the entry-level iPad Pro model now includes 64GB of storage, up from 32GB in the 9.7-inch model, which, as I pointed out in my earlier review, seemed meagre. And Apple have also doubled the storage tiers across the entire line-up, meaning you can now get a 10.5-inch iPad Pro with either 64, 256, or 512 GB of flash storage, priced at £619$649, £709$749, and £889$949 respectively. As usual, these prices are for the Wi-Fi models; Wi-Fi + Cellular configurations are available for an extra £130$130. I imagine the 256GB model will be the most popular option, since the size of music and audio apps continues to grow as more functionality becomes possible. 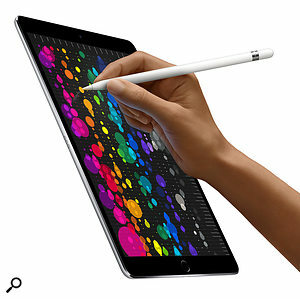 As with other Pro iPads, the new 10.5-inch model supports the Apple Pencil, and has a corresponding Smart Cover accessory that communicates with the iPad via the Smart Connector as before. One advantage of the extra size of this new iPad Pro is that the Smart Cover’s keyboard is now a little larger, and therefore a little more comfortable to type on. It’s not a spectacular keyboard by any measure, but it is at least useable. Technically speaking, the new 10.5-inch iPad is simply the finest iPad Apple have ever produced; it’s better in every possible way than the 9.7-inch model it replaces. But this superior technology inevitably comes at a price. While Apple have kept the cost structure of the line-up the same, it’s still quite a sum to spend on a mobile device. The entry-level model with Smart Cover will set you back almost as much as a MacBook Air, and when it comes to music and audio apps, desktop applications like Apple’s own Logic Pro offer richer functionality. However, this may not be a wholly fair comparison, since Macs and iPads provide functionality using two completely different paradigms. For those wishing to dabble with iOS, run a few instrument apps and have straightforward sequencing or recording needs, the regular iPad will absolutely get the job done. But if you desire the ultimate performance (with the best display yet seen on an iPad), as I said earlier in this review, this new 10.5-inch iPad Pro is stunning. In addition to unveiling the 10.5-inch iPad Pro at WWDC, Apple also upgraded the specifications of the 12.9-inch Pro model. The second-generation 12.9-inch iPad Pro features the same display technologies as the 10.5-inch model (ProMotion, True Tone, and so on), along with the improved A10X chip and doubled storage tiers at the same cost structure. The new 12.9-inch iPad Pro starts at £769$799 for the 64GB Wi-Fi model, with the 256 and 512 GB models costing £859$899 and £1039>$1099 respectively. Wi-Fi + Cellular models are again available for an extra £130$130.